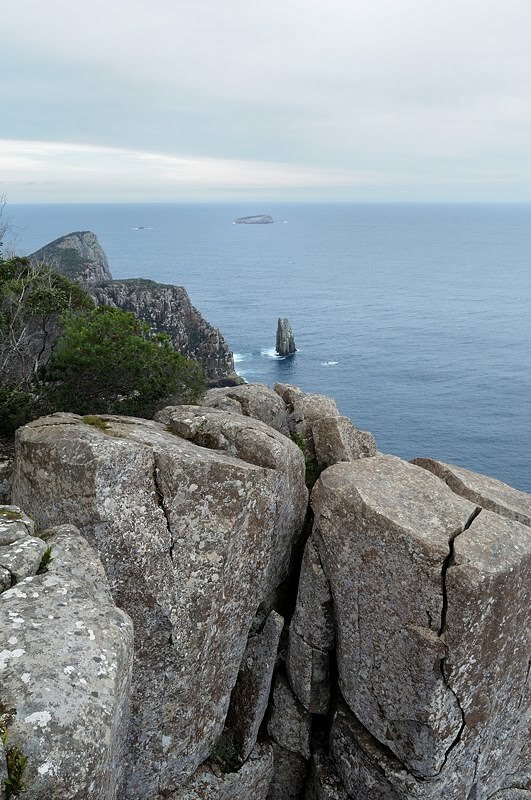 Had a trip down to the Tasman Peninsula and took the opportunity to wander out to Cape Hauy on Day One. This is a good walk, and I've put it up on here before (here and here). 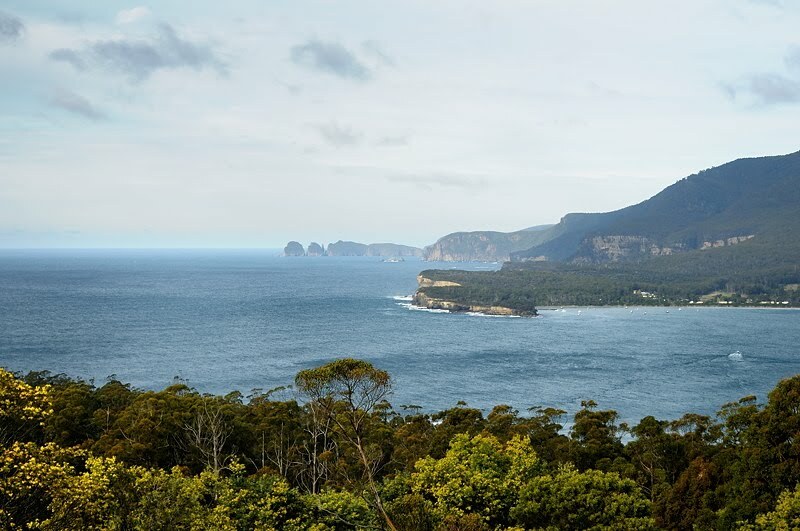 The starting point is Fortescue Bay, and the track is easy to follow. The walk undulates quite a lot, and although no individual hill is more than medium-sized it's a good bit of exercise after you've climbed and descended a few times. Views are great and the cliffs spectacular, although the light was a bit flat the other day for photography. The sidetrack to the Monument Lookout (on the way to Mount Fortescue) is well worth the short diversion, and provides a very airy view of the bay stretching south to Cape Pillar. Note that there are many opportunities for falling off cliffs along this track, so younger members of the party should be supervised appropriately. In particular, the flat spot at the end of the walk is basically surrounded on three sides by 120m cliffs sheer to the sea, which makes a great place for lunch but not for wandering about carelessly. 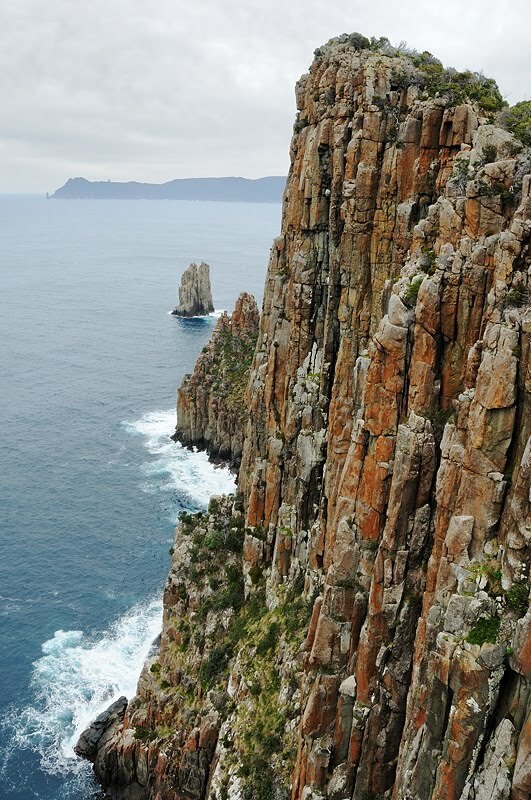 The Candlestick and Totem Pole, both goals for climbers, are located at Cape Hauy, and while they are visible from the top of the Cape, better views are available by descending steeply (and very carefully) to the northeast along obvious pads and tracks along the edge of the cliffs towards the sea. Cape Hauy, the Lanterns, the Candlestick and the Totem Pole are all visible from the lookout above Pirates Bay. This is reached by turning left along the old highway before commencing the steep descent on the new highway towards Eaglehawk Neck. The views across the bay are worth the diversion.